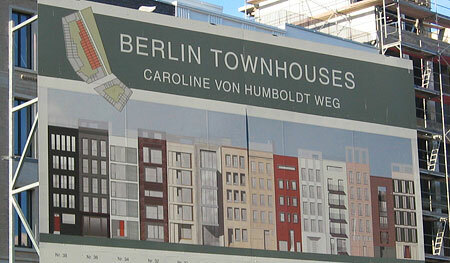 Whilst the rest of Germany discovers it has a “new underclass” it didn’t know existed, currently dubbed the die neue Unterschicht, Berlin meanwhile is busy building townhouses right in the historical center of the city, no doubt for the comfortable middle-class, who don’t exist in Germany either. Right opposite the Federal Foreign Office, two whole city blocks of townhouses are currently going up. The interesting thing about the townhouse is that historically, they were the urban properties of the well-to-do, who usualy lived in the countryside and needed a second property in the city. The word also means simply, terraced housing. Judging by the building site it will be quite a homogenous little group of buildings, all roughly the same height, all more or less the same width, all with character carefully held in check. There are some peculiar details though. 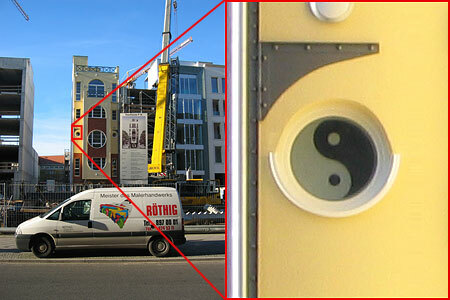 The property “Townhouse 12” features, oddly, two yin-yang symbols to the left and right of its central bull’s-eye window. Almost certainly to be taken as symbolic of the balanced nature of social standing: in every member of the underclass there’s a member of the wine-sipping bourgeoisie, just as in every middle-class citizen there’s a beery working-class core. In terms of its impact on its surroundings, these dwellings will reinforce old, lost street lines and introduce a bit of much needed density to the area, which is characterised mostly by its gaping holes and tumbleweed. SLAB will be keeping its eye on developments.